The largest company in the world by far, Wal-Mart takes in revenues in excess of $280 billion, employs 1.4 million American workers, and controls a large share of the business done by almost every U.S. consumer-product company. More than 138 million shoppers visit one of its 5,300 stores each week. But Wal-Mart’s “everyday low prices” come at a tremendous cost to workers, suppliers, competitors, and consumers. The Bully of Bentonville exposes the zealous, secretive, small-town mentality that rules Wal-Mart and chronicles its far-reaching consequences. In a gripping, richly textured narrative, Anthony Bianco shows how Wal-Mart has driven down retail wages throughout the country, how their substandard pay and meager health-care policy and anti-union mentality have led to a large scales exploitation of workers, why their aggressive expansion inevitably puts locally owned stores out of business, and how their pricing policies have forced suppliers to outsource work and move thousands of jobs overseas. 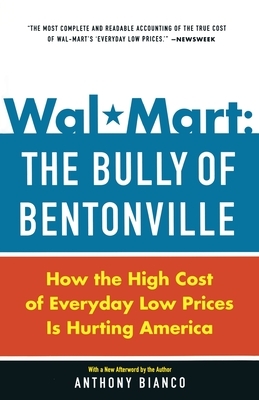 Based on interviews with Wal-Mart employees, managers, executives, competitors, suppliers, customers, and community leaders, The Bully of Bentonville brings the truths about Wal-Mart into sharp focus. ANTHONY BIANCO has been a senior writer at BusinessWeek for twenty years and is the coauthor of the magazine's acclaimed cover story on Wal-Mart. He lives in New York City.